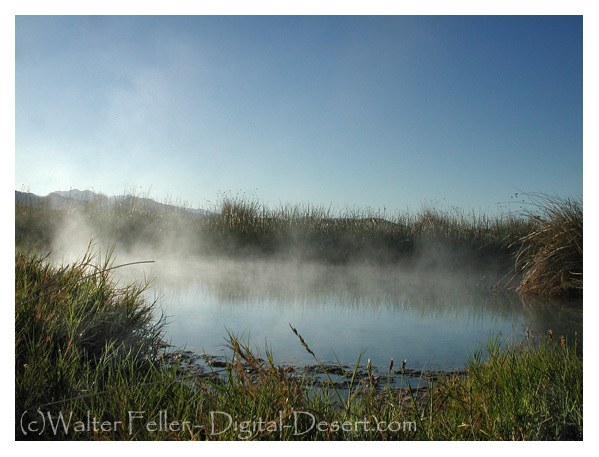 Tecopa hot springs is a "primary hot springs". Here, mineral water is geothermally heated by by magma chambers which exist miles under the Earth's surface. While the temperature of the water fluctuates between different sources, the water temperature usually measures between 116 - 118° F. The ambient temperature of the water in the summer months, however, can be as high as 121 - 135° F.
The Tecopa hot springs are not, as far as I understand, just one hots springs but a series of of hot springs in the relatively small area of Tecopa. The spring shown here is a natural-looking, yet man-made springs called, I believe, Railroad Springs. I'm not sure at all why, but it probably has something to do with the Tonopah & Tidewater railroad that ran through the area between 1905 and 1938. I read somewhere about the only one claimed to have died from the hot water was one of a bunch that would in the cold of the winter, get drunk and dive into the springs. I remember he was in his early 90s and was on the mend from a heart attack. Whether it was the hot water that killed him, or the concious abandonment of the will to live, it is over.